There's a brownie bakery over at Chelsea Market, on 15th and 9th called Fat Witch Bakery. They have the most amazing brownies. Period. My favorite is their breakfast brownie - oatmeal, walnut and coffee, with a little bit of brownie. Have that with a cup of coffee, and you're golden. 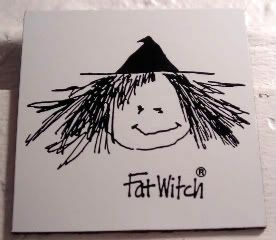 I picked this for today's magnet because I've openly been a witchy, bitchy grumpypants this whole year. On top of that, the doctors I visited last month told me I could stand to lose a couple of pounds here and there. Little did they know that hanging out in Tampa working from sun-up to just a few hours to the next sun-up, would make us drop some weight. It's the one constant that we've noticed these last twelve days down there - the clothes we brought down hang just a little looser now. For example, a snug pair of jeans fresh from the dryer...I can now pull on and off without unbuttoning them. Heh. Actually, it's because of that, that I felt totally well within my rights to go to Daily Eats just before leaving for the airport. And, I fully enjoyed that potato-chip encrusted turkey burger and honey-drizzled sweet potato fries that I have been looking forward to since the last time I was down there. It didn't disappoint. Neither did the Deep Dark Chocolate and Vanilla Bean milkshake. Fat witch that one, docs. Joy, your blog never ceases to make me hungry. Where did I put that last box of Girl Scout cookies...? I think you deserved the treat after what you've been through! Heh. Thanks. I don't mean to always talk about food, but sometimes, I just can't help it. Like ever since yesterday, I've been wondering which restaurant could I convince to add that turkey burger to their menu.